We owe a lot to the brave men and women of our military. Their families deserve a lot of respect as well. They make considerable sacrifices for us and they don't expect anything in return. Taking care of daily expenses can sometimes be a bit of a burden. So you can imagine what the idea of saving up for a Tucson home feels like. 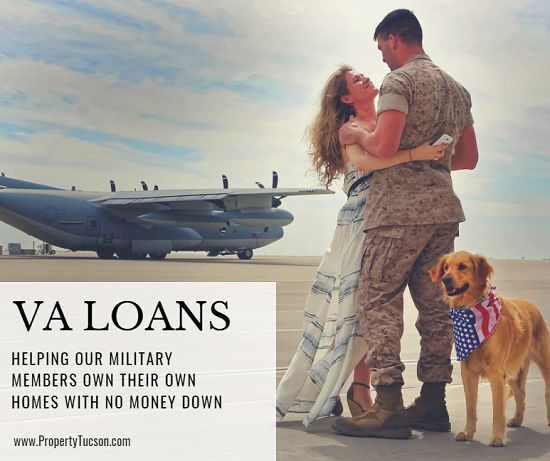 Fortunately, VA loans help military members own a home of their own. One of the biggest benefits of VA loans is that you don't have to put any money down. That eliminates a huge hurdle in the homeowner process. And unlike FHA loans, no one pays mortgage insurance either. When a buyer puts less than 20% of the purchase price down on a conventional or FHA loan, they pay extra for PMI (private mortgage insurance) each month. When you don't have to pay that, it can save you hundreds and even thousands of dollars a year. Even with no money down, VA loans require that borrowers pay a funding fee. For buyers using VA loans for the first time, this fee typically costs about 2.15% of the amount borrowed. However, if you put 10% or more down, the fee reduces to 1.25%. National Guard members and Reservists pay around 2.4% for their first time or 1.5% with 10% down. If this is your second or third time (or more) using your VA loan benefit, you pay around 3.3% of the loan amount. Still, this fee is less than the amount you would need to save for your down payment through an FHA or conventional loan. And you still avoid paying PMI. Active-duty military members tend to qualify after their first six months of service. There's a six-year wait for National Guardsmen and Reservists unless they get called to duty within that time. Then, they become eligible after 181 days of service. During a time of war, anyone serving active duty becomes eligible for a VA loan after just 90 days. You will need a Certificate of Eligibility. However, your lender can obtain this for you after you start the mortgage process if need be. The Department of Veterans Affairs guarantees the loans. But they are not a mortgage company. You must qualify for a loan through your lender's specific credit score, debt ratio, and ability to repay requirements. Most lenders like to see a minimin credit score of 620. If you bring a little cash to the table (in the form of a down payment), they might be able to work with a lower score. 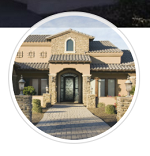 The Tucson home you purchase must be your primary residence. The highest amount you can borrow through VA loans is $453,100. For most Tucson buyers, this will be plenty. Looking for a new Tucson home? Interested in utilizing your VA loan benefit to purchase it? Contact me today.